While watching the Nightly News, local businessperson, Amber Gardner, saw a brief segment on Cash Mobs. Realizing the need to create more awareness around supporting local businesses, Amber did some online research and connected with the mobber Andrew Stamtoy in Cleveland Ohio who ignited the Cash Mob craze. Right away, Gardner organized and launched Cash Mob Sherwood. The Cash Mob is gigantic group effort! Everyone is part of the mission to make it fun and effective, bringing opportunity and support to a locally owned business each month. These mom-and-pops depend on consumer support and our community depends on these mom-and-pops. Uniting as a Cash Mob allows us to make a bigger impact together versus shopping on our own independently. It's also a fun way to get out and explore what the community has to offer, connect with friends and give back by investing where we live. 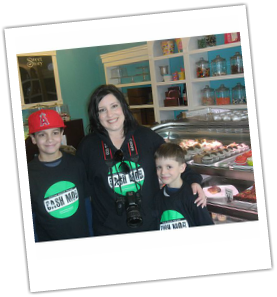 Take a look at what Michelle Howard, owner of SweetStory Bakery in Old Town Sherwood said about Cash Mob Sherwood hitting her store... Click Here and the follow-up article written about the Cash Mob in the Oregonian newspaper! Amber Gardner is the co-owner of Gardner Team Real Estate with The Hasson Company Realtors where she is a licensed Oregon Realtor and Director of Marketing for their team. Amber is also a longtime resident of Sherwood where she enjoys raising her kids, giving back and being involved with her community. The idea is to get the word out to as many people as possible. Spreading the word via social media and rallying friends, neighbors and community members together is what it takes to catapult the idea of shopping local to a new level by “mobbing” locally owned businesses in Sherwood and giving them a boost. 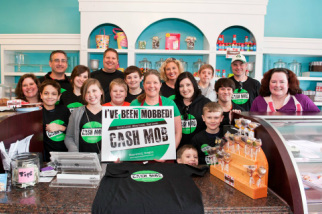 Inspired by Flash Mobs, the purpose of Cash Mobs is to support both the local businesses and the overall community. Each month a group of people will gather and descend upon a local business at a predetermined date and time, agree to spend approximately $20 and have fun. Shopping local makes a difference! According to a Michigan State University Study, 73% of dollars spent at local businesses stays in the community. Shopping local saves jobs and preserves our local vibe while reducing environmental impact and transportation costs. Beyond being the heartbeat of our local communities, these small businesses are also the largest employers nationally – they create the majority of new jobs and it’s critical that we support these small businesses. Supporting local is an investment that gives back to us all in BIG ways, one more reason to think local first and do our part to help keep the doors of our beloved local businesses open. By participating in the Cash Mob Sherwood effort, it allows us a fun way we can make a positive impact by each doing a little and together doing a lot. Never miss a Cash Mob! Cash Mob Sherwood events will take place once every month. Date, time and location will all be announced via Facebook and Twitter. For additional information or to nominate a local Sherwood business, go to www.CashMobSherwood.com. After photo courtesy of Sherwood photographer, Diana Sell. Featured here holding the "I've been Mobbed" sign is Michelle Howard, Owner of Sweet Story in Sherwood. Surrounded by some of the Cash Mob Family, not all are featured here. Cash Mob Sherwood is official! As of March 3rd, we've been added to the Cash Mob registry and are among the first two mobs to sprout in the State of Oregon! As of January, 2013 the City of Sherwood proclaimed the Second Saturday of every month Cash Mob day in Sherwood!